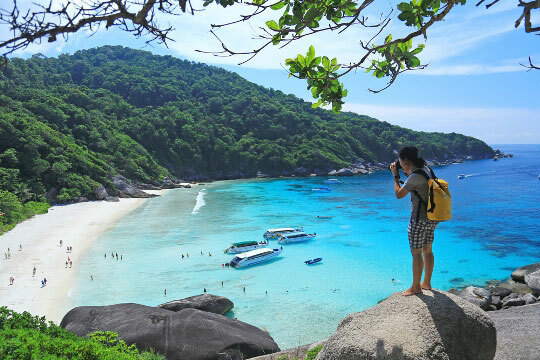 Comprising 9 granite islands covered in tropical jungle, washed by a clear blue tropical ocean and blessed with fine beaches, the Similans are Thailand's most popular and beautiful diving destination. 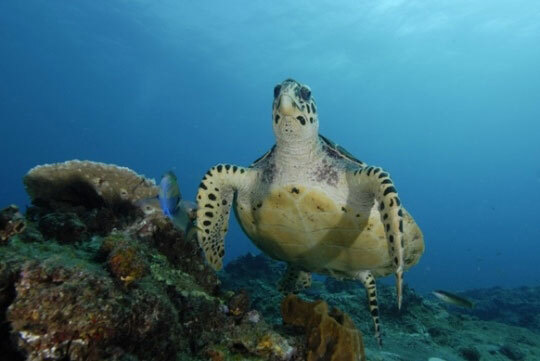 Liveaboard dive cruises to these islands, which form the bulk of the Similan National Marine Park, are some of the most popular such tours in the world as they are safe, fun and well organised, as well as being exceptionally good value for money. 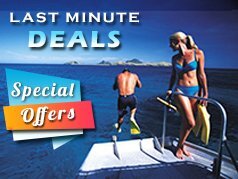 The exciting mixture of vibrant reefs and fish of dazzling colours for beginner and intermediate divers, and large deep water boulder formations for the experienced, are irresistible magnetic charms to travelers worldwide. 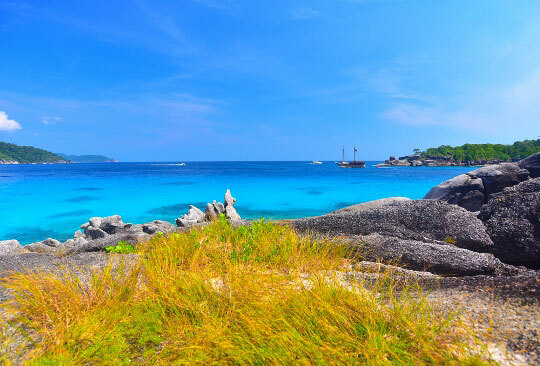 The Similan Islands lie in a 25 km long north-south chain, 65 km offshore from Phang Nga Province in the Andaman Sea, about 100km from Phuket Island on the Thai-Malay Peninsula. 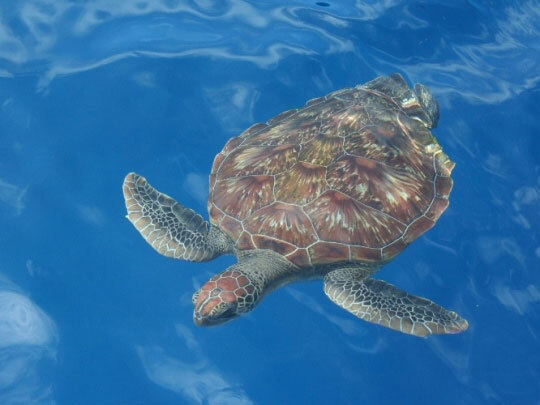 They can be reached by boats from Tap Lamu Pier, which is about 10km south of Khao Lak and approximately 60km north of Phuket International Airport. 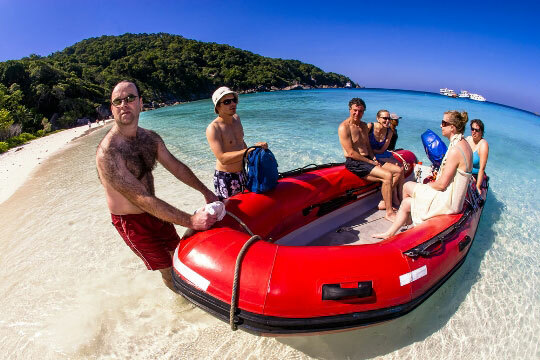 However, if you are joining a Similan liveaboard safari, you don't need to worry about this section, as all this will be taken care for you. There are daily air-conditioned and VIP bus services from Bangkok's southern bus terminal direct to Khao Lak, from where you can hire a taxi to take you to Tap Lamu Pier. Or you can get a bus from Bangkok to Phang Nga Town (approximately 788 kilometres). From Phang Nga Town it's another 65 kilometres by bus to the Tap Lamu junction, from where you can hire a motorbike taxi to take you on to the pier, another 5 kilometres away. Or from Phuket, take a bus from the Phuket Town bus terminal bound for Khao Lak and jump off at the Tap Lamu Pier junction, south of Khao Lak. Phuket International Airport is the nearest airport to Tap Lamu and has direct flights to/from Kuala Lumpur - Malaysia, Singapore, Hong Kong, Australia, and Bangkok - Thailand (for more information on how to get to Phuket, see our Phuket tourist information section). From the airport you can take taxi approximately 60km north to Tap Lamu. 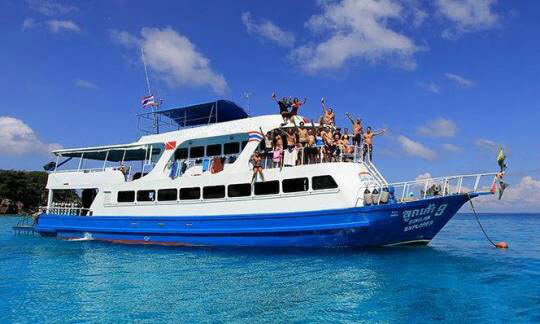 Private tourist tour boats from Tap Lamu Port to Mu Koh Similan National Park station on island number 4, depart daily. The cost for a round trip is approx. US$ 47+ per person. The boats depart from Tap Lamu Pier at 08.30 hrs. 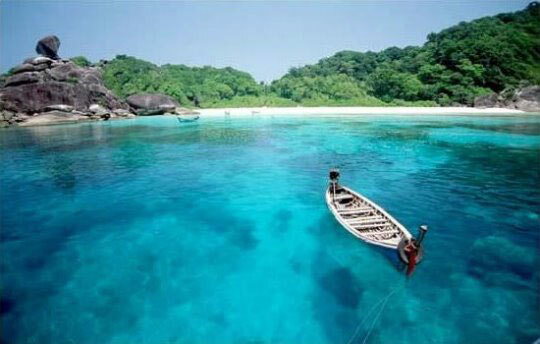 From Tap Lamu to the Similans, it's about 70 kilometres which takes 3½-4 hours. 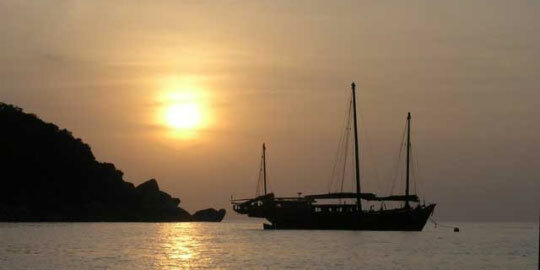 The return boats from Similan Island number 4 to Tap Lamu depart at 13.00 hrs and 15.00 hrs everyday. The service is closed from May to November each year during the rainy season. The islands' climate, like its waters, is tropical and warm throughout the year. The northeast monsoon from November into March is wonderful, with breezy clear days and fragrant cool nights. From November to April, almost every day is a sunny day. The southwest monsoon, from late May to October, brings rain and winds to the west coast of southern Thailand, and the Andaman Sea can be quite rough with high waves during this season. 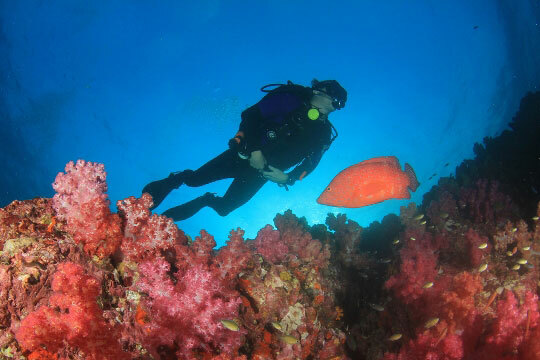 For this reason, we do not offer Similan diving packages during this time. April and May is the hottest period when the average temperatures range from 30 to 36°C. The best place to be at this time of year is on one of the liveaboard dive boats where light sea breezes bring some relief from the heat. Tourist High Season is from November to April. 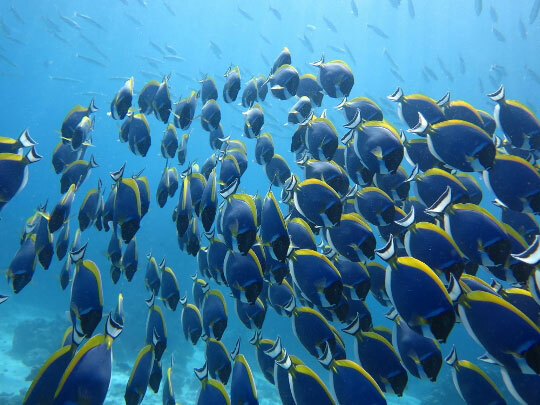 Whether you are visiting the Similans for diving or not, we recommend you try to come between February to April. This is when the weather is at its best, and the seas their calmest. The dive sites around the Similan Islands are less crowded, and it's your optimum time to see something special on a liveaboard charter as it's the season for whale sharks and manta rays. 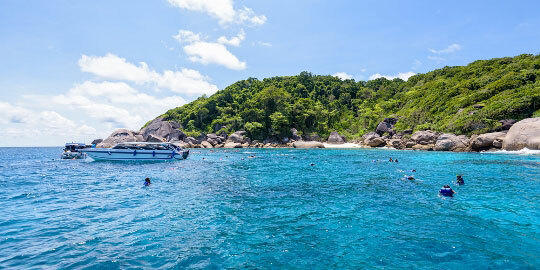 The main activities on the Similan Islands are obviously scuba diving and snorkeling, however island numbers 4 and 8 also offer bird watching and nature trails. Koh Miang, or Island No. 4, is the second largest island and is the site for the headquarters of the park. 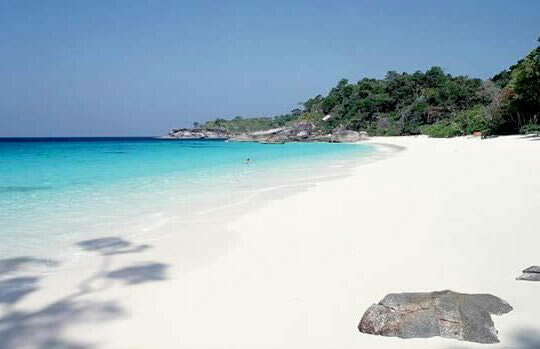 There are 2 white powder beaches as beautiful as any in Thailand. The large beach and the small beach on separate sides of the island are separated by a 10 minute walking trail through the evergreen forest. This is the best island in the park for viewing wildlife. By venturing inland, away from the beach you may catch a glimpse of the Nicobar Pigeon or the hairy-leg mountain land crab (Pu Kai in Thai, which translates at 'Chicken Crab' because it makes a noise like a baby chicken). 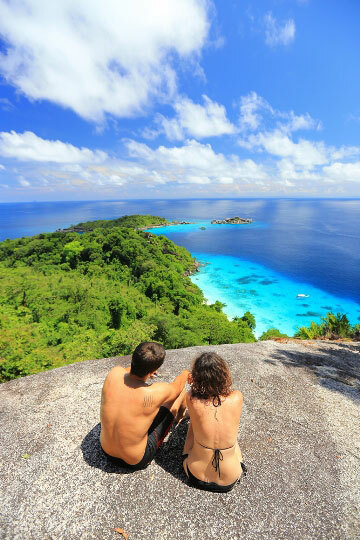 Similan Island number 8 is the largest in the chain and in its 'Donald Duck Bay', named because the granite rock formations resemble the Disney character, there is a viewpoint well worth trekking up to for sweeping views of the islands. There is also a 2.5 km walking trail here. 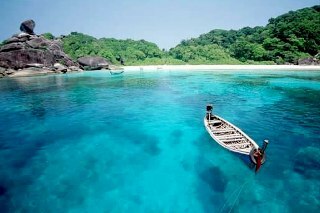 Koh Miang is also the only island with overnight accommodation. There are 25 air conditioned bungalows operated by the national park department. They are available for approx. US$ 63 per night and are always full in high season. Reservations can be made 60 days in advance with the national park headquarters by calling +66 (0)2 5620760. There is a small Thai restaurant here but there is absolutely no nightlife or bars on the islands. 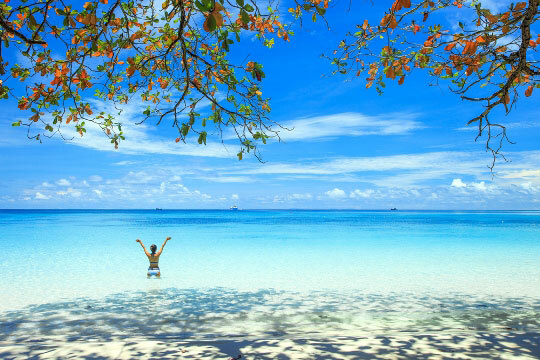 If you've come to Thailand for peace and relaxation you are in the right place. Entertainment and shopping will have to wait until you are back on the mainland. 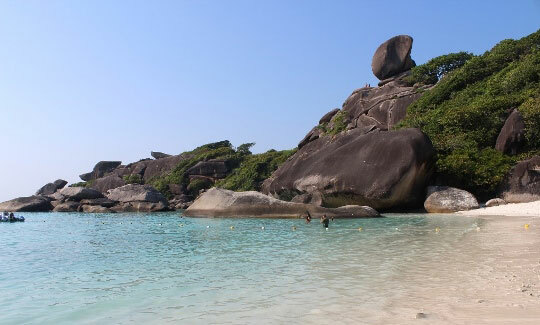 The Similan National Park was established in 1982. 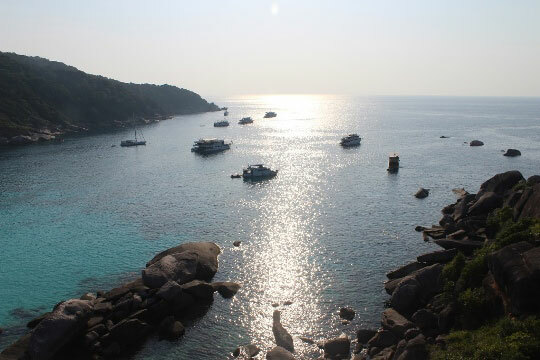 In 1998 the park boundary was expanded to cover Koh Tachai and Koh Bon, 2 islands to the north of the park boundary. The park covers 140 km², of which 16 km² is granite islands, formed by upwellings of hot magma during the Tertiary-Cretaceous period some 65 million years ago, then later smoothed by glacial ice and wave action of the sea. In December 2004, the Andaman Sea was rocked by a vicious Tsunami, originating just off the north west coast of nearby Indonesian Sumatra. The local marine department, national park, universities and volunteer divers joined forces to firstly assess the damage, and then to undertake repair work and monitor reef recovery. In general it was agreed that the coral reefs escaped very lightly in most areas, and more lightly than was originally feared. 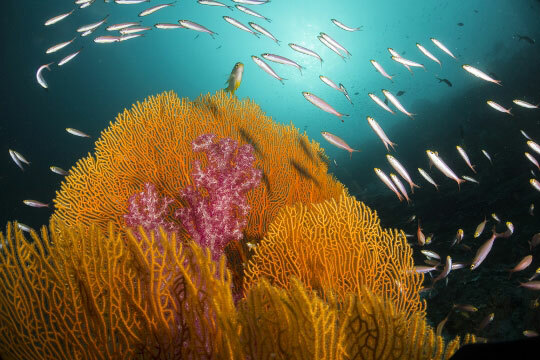 After all, coral reefs have been surviving tsunamis for millions of years already. A more detailed report on the tsunami's impact can be read here: Environmental Impact Assessment. 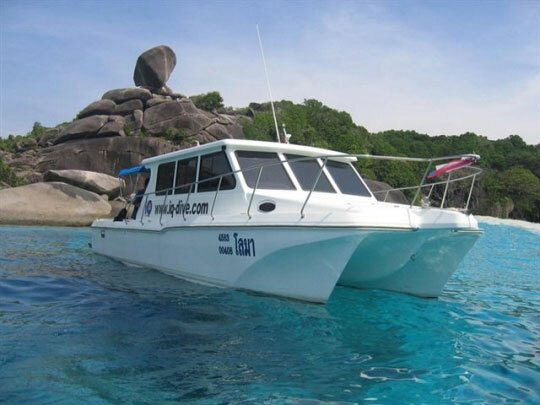 Please note however, that by far the majority of visitors travel to the Similans on a liveaboard cruise, therefore all transportation is included in the tour. Be sure to book up in plenty of time to avoid limited choice! 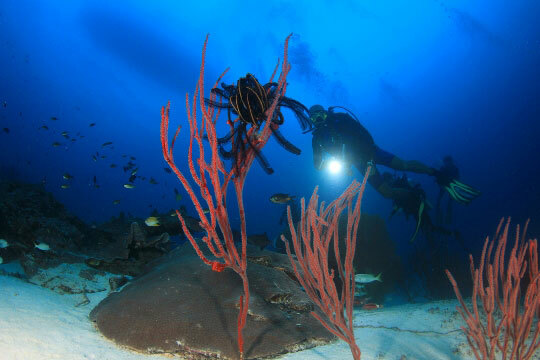 The best dive charter opportunities are booked by repeat customers who book well in advance to ensure their reservation!